When Terry Francona took over as manager of the Boston Red Sox in 2004, the storied franchise hadn’t won a World Series championship in eighty-six years. Led by Francona, the team won two over the course of four years. During the full eight years of Francona’s tenure, the Red Sox were transformed from “cursed” into one of the most successful and profitable teams in baseball history—only to fall back to last place as soon as Francona was gone. 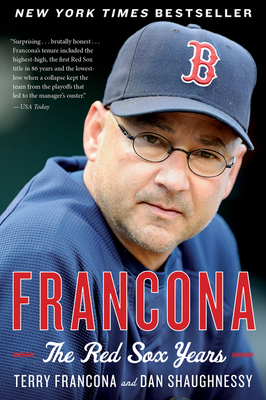 Francona: The Red Sox Years lets readers in on the inner workings of the Red Sox clubhouse like no book has ever done before. From the highs of the World Series to the lows of the final months of the 2011 season—the most epic collapse of a team in baseball history—this book features the never-before-told stories about Sox fans’ favorite players, moments, wins, and losses. Terry "Tito" Francona was a first baseman and outfielder in the majors from 1981 to 1990. After retiring as a player, he managed several minor league teams in the 1990s before managing the Philadelphia Phillies for four seasons. In 2004, Francona was hired to manage the Boston Red Sox, and that year he led the team to its first World Series championship since 1918. He won another World Series with Boston in 2007 and continued to manage the team until the end of the 2011 season. He is now a commentator for ESPN, joining in on their Sunday Night Baseball telecast and contributing to ESPN.com.